It’s one of the coolest feature unveiled on Betting Adda website. They have added a new page where you can see all members and their rankings. And guess what I’m no. 1. Boy! I’m loving it. You can access it from Top Members link at the top. Betting Adda pe membership le lo http://www.bettingadda.com/help/membership/premium-membership.html me wahin prediction deta hun. I don’t predict here. 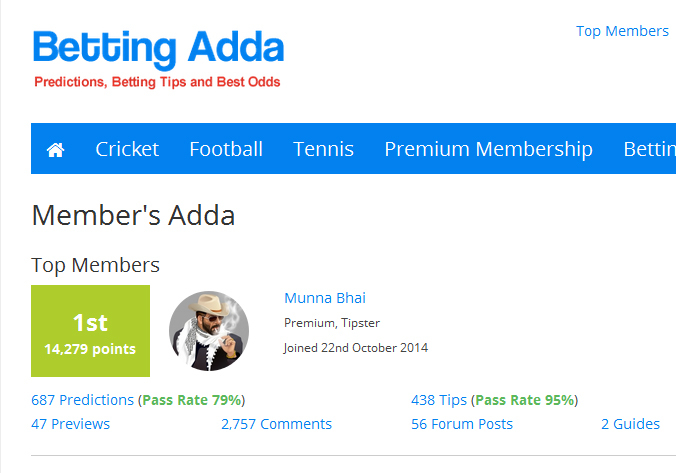 Take premium membership on betting adda and see all my predictions and betting tips there.